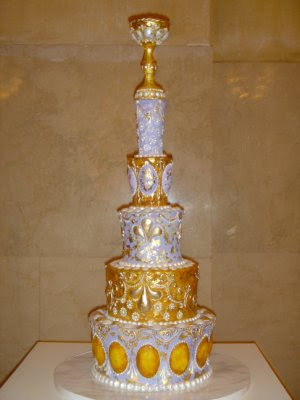 I always think of Baroque when I see a Margaret Braun cake! 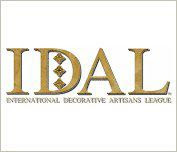 Her designs are so over the top, every inch treated with ornamental decoration. Cathedrals were treated as large, lavish cakes, frosted with gilded plaster ornament. No surface was ignored. 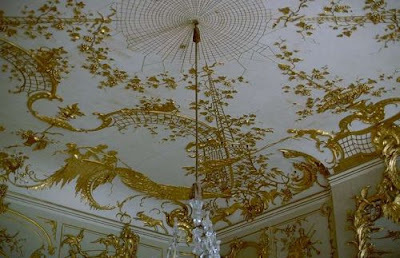 Ceilings told ornate stories in chinoiserie themes, with lots of lattice, flowers and cherubs. 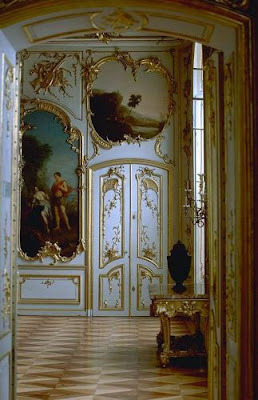 The blending of painting and opulent architecture were characteristic of the Baroque era as seen here in the Sanssouci Palace, home to Frederick the Great, King of Prussia. Schloss Charlottenburg in Berlin, the largest surviving royal palace, was designed by Georg Wenzeslaus von Knobelsdorf. 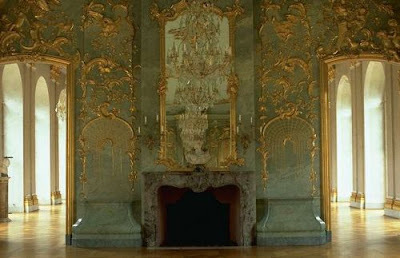 Knobelsdorf studied in Paris and Italy and came back to Berlin to create Frederickian Rococo. 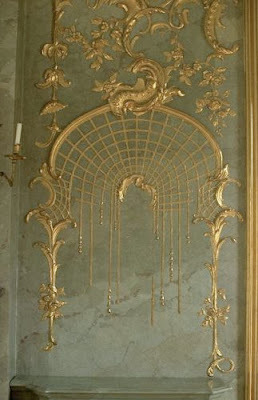 This Rococo style was a continuation of the Baroque influence. Every surface was treated as a potential canvas for decoration. 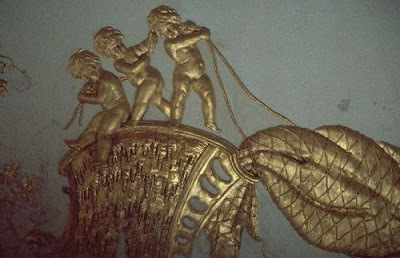 Elaborate scenes were carved from plaster and gilded spilling over from walls to ceilings. Palm fronds and trellising were also common subject matter. 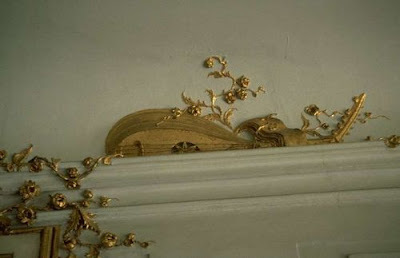 The shell shaped curves were also seen in porcelain with gold edging many times over a mirrored background. 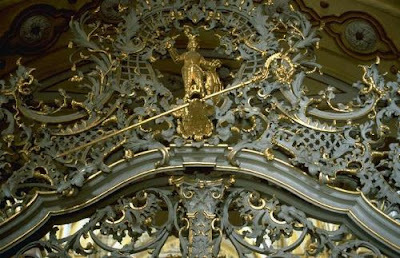 Baroque artists gave us glorious detailed ornaments. 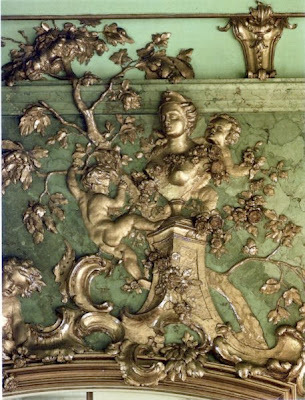 Adding beauty though dimensional carved ornament and using piping bags to create vines, flowers and trelliswork, they were the cake decorators of Baroque architecture. All photos (except the cake) are courtesy of the Berger Foundation. Mmmmmmm Baroque architecture. The combination of heavy, intricate painting and the lightness of all the Baroque ornamentation at Sanssouci is delicious. And the parquee floors!! 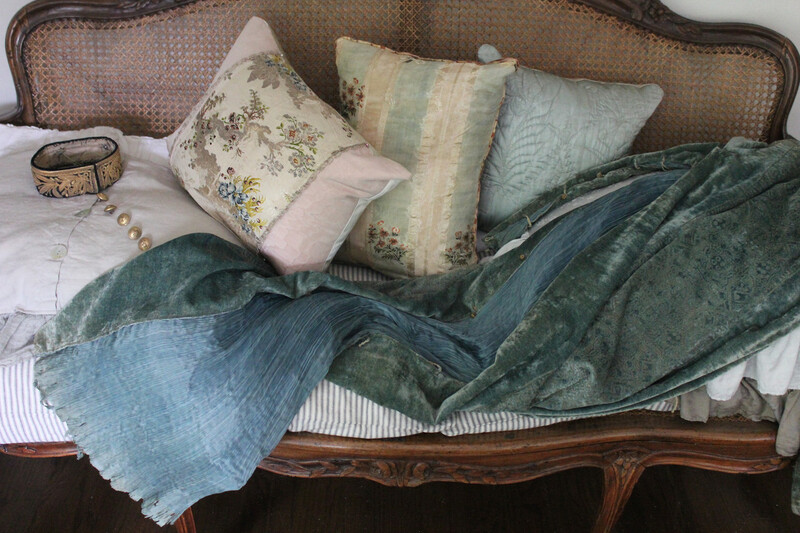 So much texture, so much pattern, so much richness to digest. Hi Theresa, .......... do you think Frederick baby would consider us moving into this joint???????? I WOULD SPEND ALL OF MY TIME laying on the floor,.......gazing into the years past.....LOVE this!!!!!! I am Cameo from the Tracy Porter blog. Please come by to visit us more often........Love your style!!!!! Devolution defined: that was then, now is cottage cheese ceilings, almost always painted white. And they call this progress? I think you and Lauren together on a project might help even the score, though! so Roccoco is more elaborate than Baroque? Oh Kitty! You've opened a can of worms! 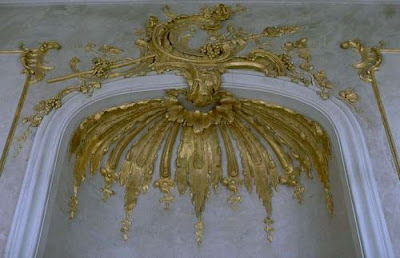 These pictures are a mix of both styles....typical of any period of evolution of style, there is no clear cut stopping of Baroque and starting of Rococo, they continued to influence each other...BUT, it you want an answer, Rococo was actually considered a lighter style, known by its use of shells and curves and usually lighter pastel colors. 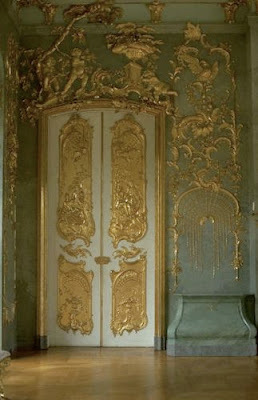 Baroque is always the heavier, more elaborate design. Thank you Lala! I feel that eastern Europe has some incredible art that does not always get exposed to the world. Another fascinating post! I linked to you in a post I just did on antique vellum books and the marbleizing that appears of some of the volumes. I always learn something here. Thanks, Theresa. 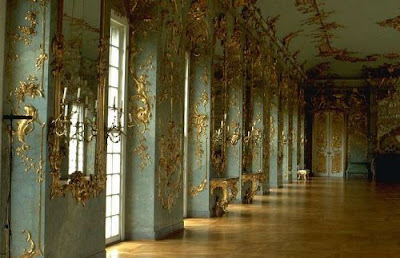 Totally gorgeous, I love Baroque music and Baroque architecture and ornamentation! There's a lot of baroque around Vienna, but I have never seen a cake as elaborate as Margaret Braun's (Martha Stewart, eat your heart out!). Thank you for visiting my blog and your kind comments. I am looking forward to seeing you again! Oh I love not only Baroque, but I love its costumes, music too. Luckily Istanbul (where I'm from) hosts many different varieties and gorgeous examples of Baroque architecture, even Neo Baroque ones. Thank you Nihal for visiting my blog. 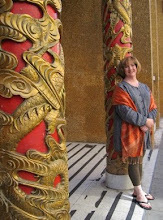 I love Baroque and have studied French Baroque dance with a master. So feminine...and, well, golden. I can see you dancing in a golden aura....fantastic! Cake decorators of Baroque architecture describes it perfectly!